Guiding people as they traverse some of the most difficult periods of their lives, we offer dedicated family law services at the Law Office of Stephan E. Uslan in Denver, Colorado. Looking out for their best interests and those of their children, our attorney helps our clients achieve favorable resolutions to their legal issues so they can begin rebuilding their lives and moving forward. Our law office understands the financial strain people may experience when dealing with family law issues, and we accept credit cards for our clients' convenience. Having 40 years of legal experience, we have helped people obtain positive solutions to cases involving issues such as divorce, custody and visitation, child support, maintenance, property and debt division, and post-divorce modifications. We tailor our strategy based on each client's specific needs, striving to efficiently and effectively settle their legal issues. Our attorney serves as a trusted legal advisor to and an aggressive advocate for clients throughout the Denver metropolitan area. Our boutique law office provides the personal attention and sensitive assistance that people need when dealing with family law matters. We are available to answer our clients' questions as they come up, and regularly update them regarding the status of their cases. 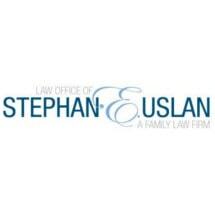 At the Law Office of Stephan E. Uslan, we understand that dealing with family law issues is often emotionally charged, and sometimes people's judgment can be impaired. Our attorney assesses each client's case, analyzing it from every angle. When people work with our team, they can rest easy knowing they are receiving the honest, objective guidance they deserve. It is our goal to make the legal process as smooth and stress-free as possible for them and their families. I was extremely pleased with Steve’s representation of me at a very difficult and vulnerable time. He is a good listener, kind, very experienced and very smart. Because he is a solo practitioner, he alone handled every aspect of my case and I was never passed around. I always trusted him and his advice and witnessed that he was never intimidated by the other side. My input and ideas were always respected by him as well. His business card suggests that he strives for integrity, commitment and results. ALL TRUE. He is a good man and extremely dedicated to his clients. I am grateful to have found him.